I love to see kids using their imaginations and playing outdoors. It is so healthy for all of us and it’s the sort of activity they don’t get to enjoy as much during the school year. Recently I feel like the girls have really found their groove with the long summer days and are coming up with all kinds of things to do! 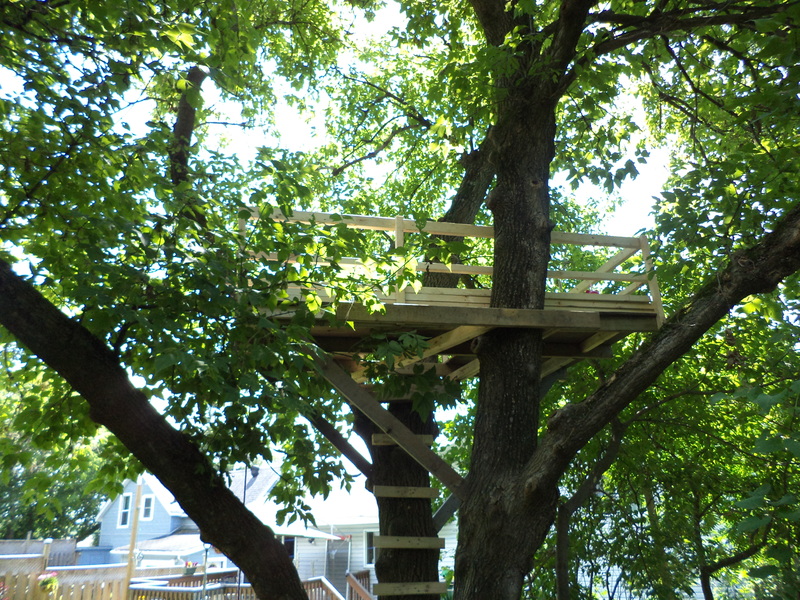 As I mentioned briefly in my last post, my husband has been working on building a tree house the past week. 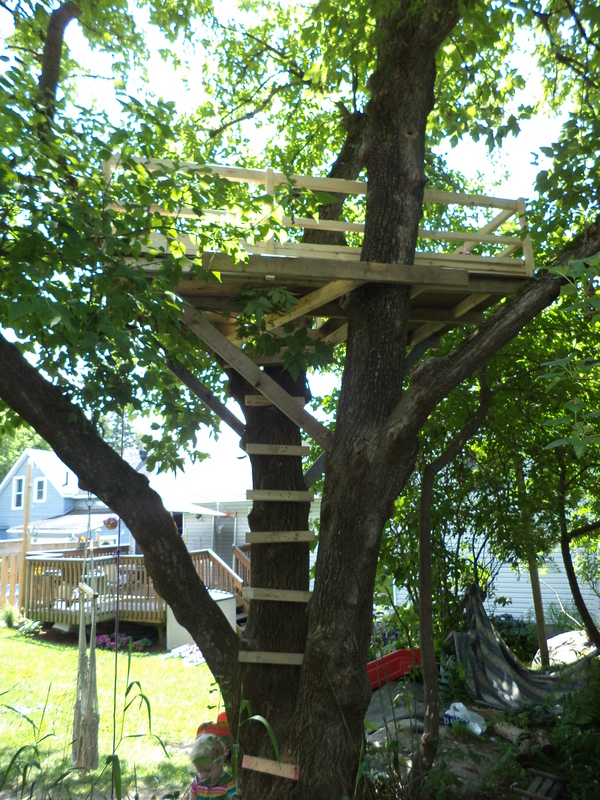 He was actually pretty stoked about this since he’s always wanted a good reason to build a tree house apparently! 🙂 The girls were so excited about this and loved helping him. I cringed as they wielded hammers, winced as they helped him saw and covered my eyes when it was finally complete enough for them to clamber up there…WAY up there! Don’t get me wrong, I love the idea…but spending the last few years providing daycare for other people’s kids and being a foster parent for the Children’s Aid Society has sharpened my ‘safety first’ instincts! I tried not to let my nervous squeaks ruin their excitement and pushed away the jelly feeling in my stomach when I climbed up with them the first time. Is it safe? Barely. But is it fun? You bet it is! This is why Akeisha and Alexa need a Daddy. I encourage and applaud them when they are adventurous and brave…but I’m not as good at providing opportunities for them to practise those characteristics. 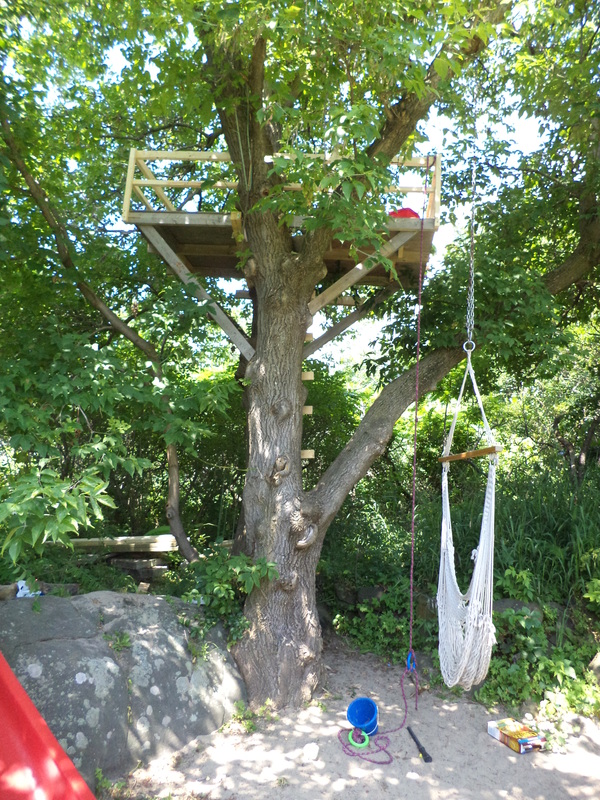 It really has been tons of fun, though, this tree house thing. It can become a pirate ship, a secret clubhouse or a cool place to have lunch! Yes, that was today. Tuna sandwiches, carrots and apples are so much better when devoured with grimy little fingers as we gaze around at green, leafy walls. 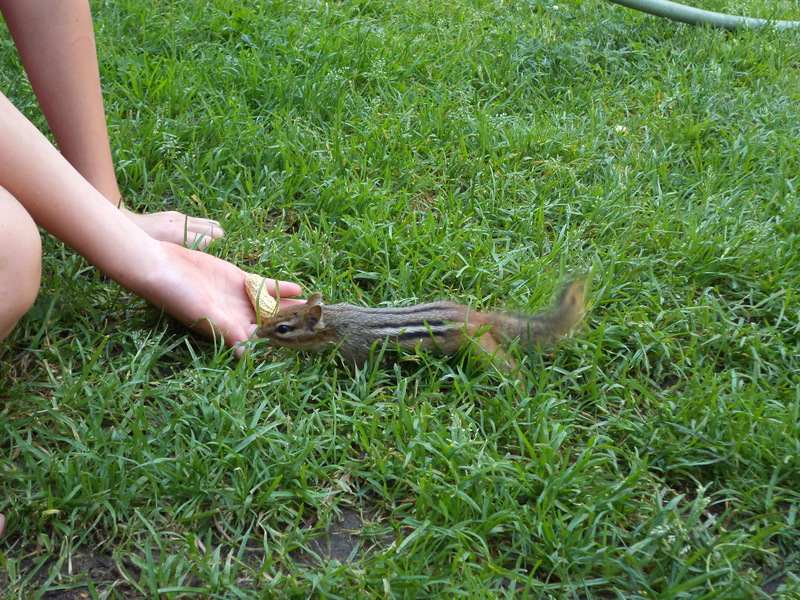 Even the chipmunks, who have been feasting on peanuts right out of our hands, managed to crawl up there and try to steal a few crumbs! It makes me feel like a child again…climbing trees, brushing the dirt off my sandwich, feeling rough wood on my feet and going out of the way to make each little moment extraordinary. There’s even a trap door, which makes you feel like you’re entering a secret hideaway! Akeisha tied a rope to a bucket so that they could transport all kinds of treasures up and down. She also tried ‘fishing’ for chipmunks from her leafy hideaway which resulted in one clever little chipmunk getting quite the surprise when his peanut wouldn’t come free! 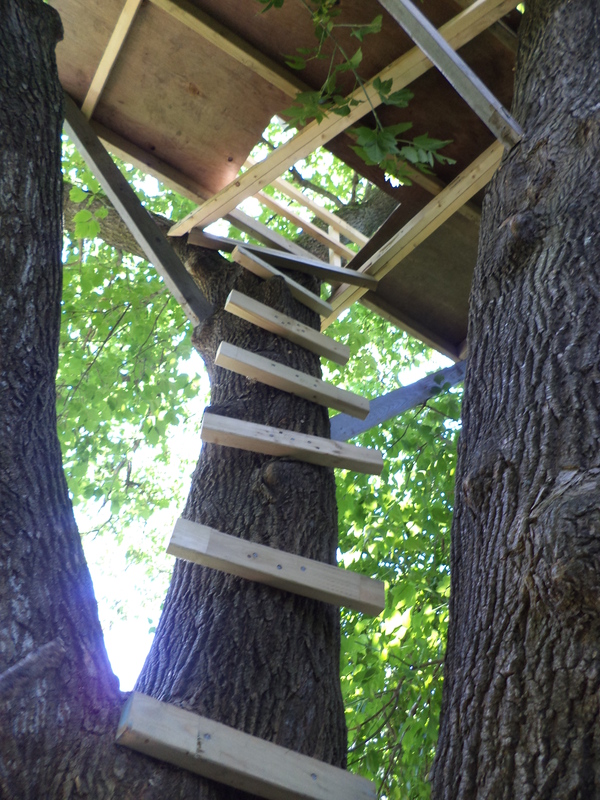 There is also still a little fort in the bushes that gets some attention, a bear trap that was created ‘just in case’ and a new favourite hobby…picking apples from the wild apple trees beside our house! Every now and then we still catch caterpillars and put them in our bug buckets…though they rarely get attention after that so they have a rather unfortunate end. Akeisha is usually the ring leader of all these activities and the past few days working alongside Daddy she became enthralled with the idea of ‘working.’ So yesterday all day I was her boss and she drove to work in her workboat, just like Daddy. She was so cute all dressed up in Daddy’s big work boots, a Rockscape Design hat and a big sweater that covered most of her body. She took lunch breaks and even did a bunch of jobs for me as my ’employee.’ Hey, if she’s into working and having fun I’ve got all kinds of jobs that can be done! 🙂 After making the beds, doing dishes and sweeping the floor she was ready to go back to pretending to work like Daddy, not me! Lol. Our poor little doll babies who got such devoted attention a month ago have been rather neglected, but every now and then they still get a few cuddles, a walk to the park or a diaper change. Crafts have been a big hobby lately and this mother has had to grin and bear all the glue, string, little paper pieces and wasted tape that goes with that! Most of the crafts have been things for the fort or tree house. I am so grateful for the little haven we have here up at the top of a quiet dead end street. We have a perfect backyard for kids to be able to explore, play and create despite it’s small size. Alongside all these backyard adventures I am just celebrating every little sign of attachment I see in our daughters. Today Alexa, mimicking the words I’ve said to her so many times, told her doll “I’ll love you always and for ever NO MATTER WHAT!” She also played shy and stuck right by my side the whole time a woman selling books dropped by this morning, which is a great improvement. The last phone conversations we had with the girls foster parents were remarkably different than a few weeks ago. Instead of the girls needing to know all about their former homes and what they were missing, they were able to excitedly share about the fun things that have been going on here! We are hearing mostly Mommy and Daddy again, after a few weeks of reverting back to our names, and they are even able to have conversations about their new last names without feeling quite so threatened. Alexa has a habit of coming up to me any random time and saying, “Mommy, I love you.” No reason at all. No particular emotion to provoke it. Simply I love you 🙂 She loves when I call her my baby. A favourite bonding activity is to be wrapped in a big towel after her bath and carried back to her room. Daddy still gets greeted with huge shrieks of joy each and every evening…and he deserves every ounce of adoration the girls give him. He’s amazing. Day after day he comes home from work and pours a truckload of energy into the girls. Alexa loves her snuggles from Daddy, climbing into his lap after supper just like I used to do with my Dad every night. My favourite quote of hers was one Saturday morning as she crawled into bed to snuggle beside him. “You’re my warm and fuzzy Daddy,” she said as she rubbed his whiskers affectionately. 🙂 She has been a Daddy’s girl since day #1 and there is just a bond there that I love to watch. Akeisha likes to get quality time and attention, like helping him build the tree house or sitting on his lap chatting. She got to stay up late a few nights just chatting with Daddy and it was so eye opening to hear her questions and comments. They talked about everything from house fires to school to her day. She was amazed to hear that Daddy would come back in the fire to find her if he knew she was still inside, and once again I was reminded how much we need to voice those things. When trust is just being built, those things are not simply taken for granted as obvious facts like they were for me when I was a child. They love to hear us say adamantly how much we would miss them if they left us and how we would follow them! They’ve decided once they’re big enough to be moms themselves they will live next door to us in the house that is for sale so that they will not be far away, and talk about saving up their money for that. 🙂 Right now I am listening to them play house. Akeisha is the mom and Alexa is the child. Alexa has just been put on a ‘time-out’ by her sister and Akeisha is carefully explaining why exactly she is there and what will happen. Wow. Sponges. It is incredible to hear your voice being parroted back at you. The other day Akeisha said to me, “Mommy, I wish I would have been in your tummy.” We’ve had this conversation a few times. When I smiled, hugged her and said “Me too,” I could see her beautiful brown eyes glow. We have so much yet to cover about the life they’ve already lived without us, but in those little moments we understand who we are. We are a family. I have no idea why God has allowed me to parent these girls. I feel so unworthy some days. But it really is the little things that matter so much. It’s the way I speak, the way I go about my day and the things I place at the top of the list. Through two pairs of young, searching eyes I get the chance to portray a tiny piece of what Jesus looks like. When I stand before Him some day, I know what I am doing today is going to matter. They are golden opportunities. That can feel overwhelming, but I also know that it does not all depend on me. God chooses to use me, but He doesn’t need me. He will bring the increase.